This brief summary of our South Africa food history will take you to the cradle of the country’s rainbow cuisine and its origins. The fascinating variety of different culinary traditions is overwhelming. From the deliciously diverse flavours of South Africa’s indigenous and multi-cultural rainbow cuisine to culinary specialities from allover the world. Those who have seen the landscape of the Namib and the Kalahari deserts where the San people live and roam, may easily laugh at the thought of any form of culinary enjoyment there. 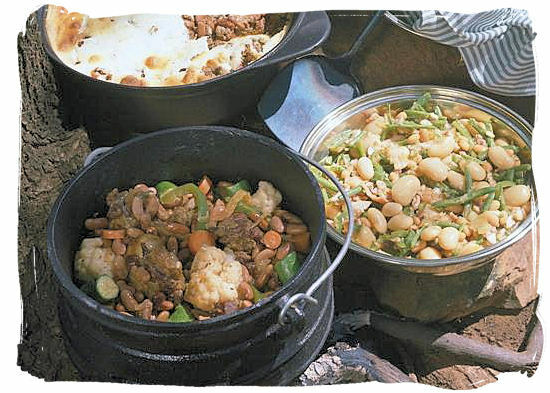 It is difficult to ascertain to what extend the South African cuisine was influenced by the "Khoi" and the "San" people. South Africa food history shows however, that the San people did enjoy a surprisingly varied menu of edible roots, leaves, plants, berries and nuts gathered from the "veld" (field). 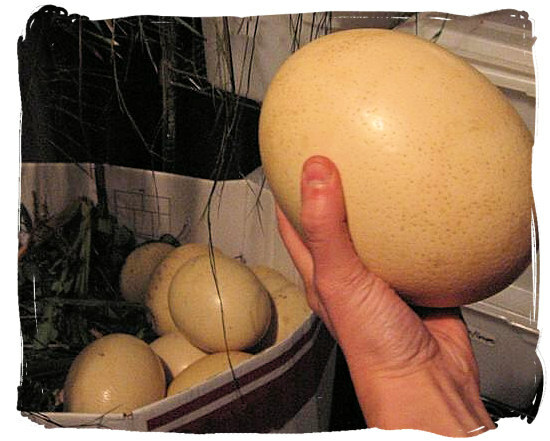 They also gathered eggs, being particularly fond of ostrich eggs. To complete the menu they hunted for meat such as antelope, birds and small animals. Some of the Khoi people living at the coast close to the beach known as the "Strandlopers" (beach walkers), had a diet just as varied. They dined on mussels, abalone, crayfish, seals and penguins, supplemented with edible wild plants, fruits and seaweed. At a certain stage in their history, influenced by the livestock farming culture of the Bantu people, the Khoi people changed their source of food supply from gathering and hunting to a nomadic type of livestock farming, starting with sheep at first and adding cattle at a later stage. Mutton and meat from other domesticated animals became an important part of their cuisine. South Africa food history tells us that one of their favourite menu items was crisply fried sheep-tail fat called "kaiings" (cracklings). 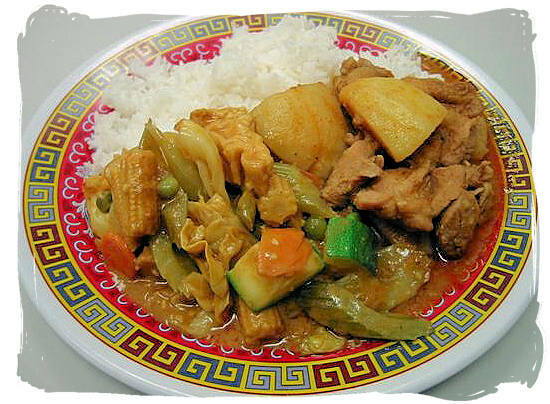 Today one can still feast on delicious "Kaiing" dishes. Fact is, that the early settlers and later the "Voortrekkers" (migrating farmers) learned from their knowledge of edible plants and herbs in the wild, using these plants and herbs in their "Potjies" (cooking pots), salads and jams. An famous example is "Waterblommetjies" (water-lilies) which grow in abundance in the dams and ponds of the Boland region beyond Cape Town. In season these little creamy white flowers make it to the table in the form of a "Waterblommetjie bredie", a delicious stew usually (but not necessarily) made with mutton and flavoured with sorel. In their quest to find a halfway refreshment stop for their merchant ships travelling around the Cape to Java (Indonesia) and back, the Dutch East India Company (VOC) decided to establish a refreshment station at the Cape. The first project Jan van Riebeeck undertook after arriving at the Cape in 1652, was to establish vegetable gardens to produce the fresh food needed by the passing ships. And so the Dutch introduced a large variety of vegetables and fruit foreign to south Africa. Today one will find a beautiful park, a tourist attraction called the "Kompanjiestuin" (company’s garden), at the same spot where Van Riebeeck laid out his vegetable farm in 1652. The early settlers brought their Dutch cooking tradition with them, which consisted mainly of stewing meat and vegetables in a pot over a fire. Soon they learned about the wild plants and herbs used by the Khoi people in their cooking and added them to their stews. They learned about hunting game and grilling the meat over an open fire. Later they learned about spices from the imported Malay slaves. And slowly but surely the original Dutch cooking customs started developing into what is known in the South Africa food history as the "Cape Dutch" cuisine. The so-called Malay slaves imported into the Cape by the Dutch East India company in 1658, came from Indonesia, Malaysia and Madagascar. Indonesia was a Dutch colony at the time. They brought with them their cooking traditions, which were characterized by the use of a large variety of spices. Many of them, particularly the women, were employed in the households and kitchens of the settler families. Their ability to adapt their recipes to locally available ingredients soon became apparent and their cooking talents, using the aromatic spices from the Far East, greatly enhanced the local settler cuisine. 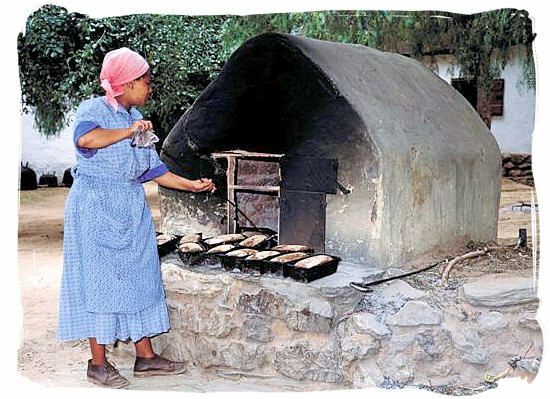 This was an important development in the South Africa food history. The Cape Dutch cuisine that has emerged from this culinary fusion, owes at least as much to the cooking traditions of the slaves, as it does to the European styles of cooking imported by the settlers. Next to the Dutch settlers, there were many colonists from Germany, France and later Great Britain who have added their European cooking styles to the settler cuisine in the cape colony. The German colonists in the cape settlement were mostly assimilated by the Dutch community. 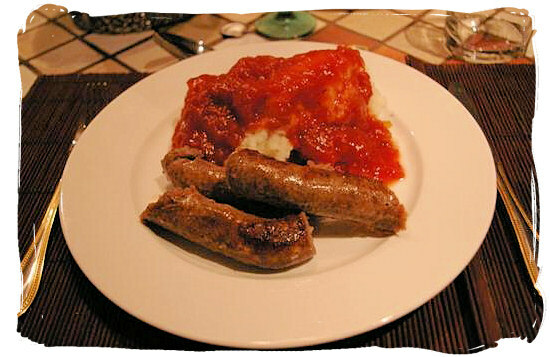 They didn't really have any influence on the cooking style in the colony, except for the introduction of "Wurst" (sausage), from which our famous South African "boerewors" (farmers sausage) has eventually developed. The French Huguenots, fleeing from religious persecution in France, were another European culture that settled in the cape in 1689. The stamp they put on the Cape Colony’s cuisine was more in the line of refining it. They were the ones that changed the way food was served, from serving it all at once allowing everybody to select what they wanted to eat, to serving the dishes in a sequence of multiple courses. One of the most significant facts in our South Africa food history is that the French Huguenots stood at the cradle of South Africa’s great wine culture, having brought with them the centuries old French wine-making tradition together with a collection of vines to start up their vineyards. When the British took over permanent rule at the Cape in 1806, a different lifestyle was introduced and their English breakfast replaced the custom of serving the previous night’s leftovers as breakfast. They also left their mark with their "pudding" culture, their pies and their English roasts, which developed into the carveries we know today. The Portuguese were the first Europeans to set foot on South African soil, but they did not make any attempts to colonize it. Later they migrated to South Africa in considerable numbers from the Portuguese colonies Madeira, Angola and Mozambique, where the use of chillies had become an important factor in their cookery. Where European-Portuguese food is delicately flavoured, South African-Portuguese cuisine is daringly fiery, as expressed in their hot peri-peri dishes. About two hundred years after the arrival of the Malay slaves, the first boatload of indentured labourers from India arrived in the harbour of Durban to work un the sugarcane fields of Natal (KwaZulu-Natal). When their 10 year contracts were over, they stayed. The essence of the Indian cooking tradition, is said to be the large variety of curries (there are 22 main varieties) they use in their recipes. 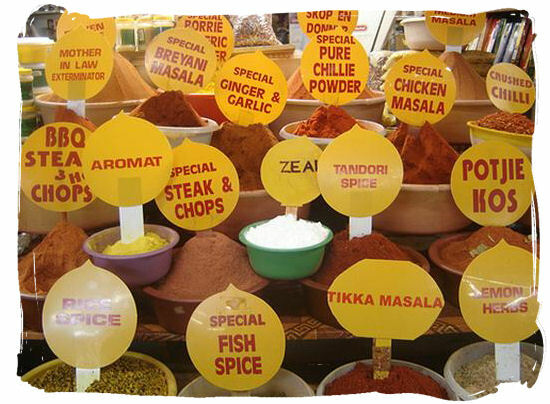 Curry dishes have become very popular in South Africa among people of all ethnic groups. Curry and rice is a national favourite almost as popular as “pap en vleis” (maize meal porridge and meat). In the process rice has also become popular as a staple food next to maize. Both coming from the Far East, there are similarities between the malay and Indian cuisines and they often supplement each other. Having migrated from the north, the Bantu people settled themselves in South Africa around 1000 AD at the end of the Southern Migration. Using for those days sophisticated iron tools, they introduced agriculture in South Africa, practising the cultivation of a variety of crops such as maize, sorghum, millet and vegetables amongst others and keeping herds of domesticated cattle. The cattle was mainly used for the production of milk. For meat they preferred mutton, goat or game. 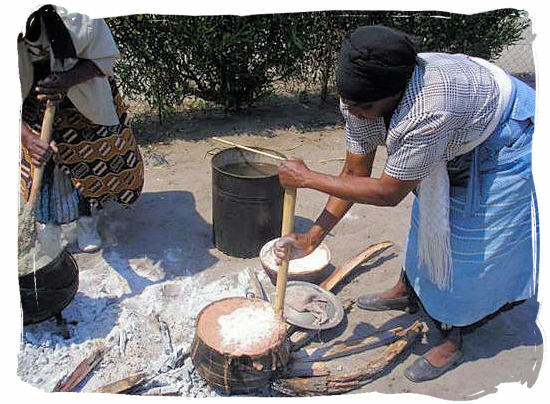 From the early days in the South Africa food history they have been cooking their "mieliepap" (maize porridge) in a three-legged pot over an open fire. Meat was grilled over an open fire or also cooked in a pot. An important protein supply for the Bantu people were insects as Mopani caterpillars, locusts and termites. 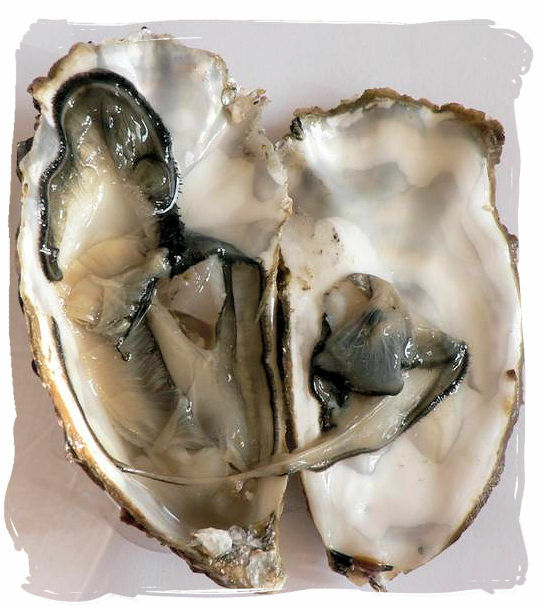 Fried, grilled or cooked they are still considered delicacies today. The traditional Xhosa dish "Umngqusho" is said to be one of Mr. Nelson Mandela’s favourites. It is made with “stamp mielies” (broken dried maize kernels), sugar beans, butter, onions, potatoes, chillies and lemons, and allowed to simmer for a long time until all ingredients are tender. Right through the country’s history, from the days of the "khoi" and the "San" people and the days of the Southward Migration, to the days of the Great trek and the days of the Anglo / Boer war, people were constantly on the move. It was characteristic of the way of life of many of the country's different cultures. Very few provisions were taken along when moving from the one place to the next. During the greater part of the South Africa food history, people had to live of the land. Game was plentiful in those days. The most perishable meat and organs like liver and kidneys were eaten first. The bigger cuts or whatever was left over, was cured, dried and cut into strips, to be enjoyed later. Today it's called biltong, a delicacy as popular as modern day's chips and other salted snacks. Next to grilling over an open fire, the "Potjie" (cast-iron stewing pot) was the one and mostly only utensil for cooking an all in one meal. Next to biltong and "potjiekos" (pot food), pickled fish, spiced and marinated venison, home baked pot bread and "braaivleis" (barbecue), are some of the culinary legacies left from the nomadic days of South Africa’s people.